Airtac International Group with its headquarter located in Taiwan and established in Taiwan in 1988, is a well-known supplier/manufacture of pneumatic equipments in the world market. 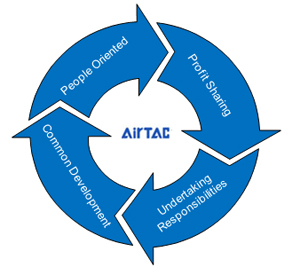 AirTAC is specialized in producing actuators, control components, air preparation products, and accessories, which are widely used in the automotive, machinery manufacturing, metallurgy, electronics, environmental protection, lighting and textile, ceramics, medical equipments, food and packaging industries. •The R&D Center of AirTAC International Group is located in Ningbo, with a building area of 10,527 square meters. • China Sales Headquarter-AirTAC (China) Co., Ltd, located in Ningbo, with a building area of 33,000 square meters. • European Sales Headquarter- ATC (Italia) S.R.L. is located in Milan, Italy. • Southeast Asian Sales Headquarter- AIRTAC INTERNATIONAL (SINGAPORE) PTE. LTD. is located in Singapore. • AIRTAC INDUSTRIAL (MALAYSIA) SDN. BHD. is located in Johor Bahru, Malaysia. • AirTAC Co., Ltd. is located in Higashi Osaka-Shi, Osaka, Japan. • AirTAC Industrial Co., Ltd. is located in Taipei, Taiwan. • AirTAC comprises four large production bases in Ningbo, Guangdong, Taipei, and Tainan. • AirTAC Ningbo is located on a site of 240,000 square meters, with 23 standard workshops. • AirTAC Guangdong is located in Nanhai District, Foshan City, with a building area of 34,311 square meters. • AirTAC Taiwan is located in Tucheng Industrial Park of Xinbei City, engaged in manufacturing precision cylinders, with a modernized office building and a finished-product warehouse with automatic storing system covering 4,800 square meters. • AirTAC Tainan is located in Tree Valley Park of Tainan City on a site of 71,376.91 square meters, the first phase of which is with a building area of 103,289 square meters and expected to be completed in the end of 2014.